It is good to see that, among others, Edward Pentin has taken up Cardinal Vincent Nichols' disconcerting media response to the 'letter of the 500 priests' stating their - shock horror! - unwavering support for the Church's teaching. I - among many - don't think that His Eminence's media statement is very prudent. Bizarrely, it pits a Cardinal - one Cardinal - for he claims to speak for nobody else in the Bishops' Conference - against 500 faithful priests in England and Wales, among whom are priests in his own Archdiocese. Of course, it may be that there are many priests who felt they could not sign that letter. One gives his reasons in the Catholic Herald, reasons that I personally don't find particularly convincing, but nonetheless, they are his reasons. A priest who signed is more convincing because he is writing about his convictions. So is this one. Nevertheless, the Cardinal's comments suggest we seem to be moving very quickly from a 'free and open' atmosphere of debate over the Synod's proposals to 'criticism of the Synod on the Family is gossip and gossip is evil so stop it'. The Pope's comments concerning 'gossip' over the Synod are worrying but they are nicely general and vague. Cardinal Vincent Nichols, who I had thought was 'good with the media', has been overtly specific in his statement. It's not just anyone he has directed his opposition towards - its 500 clergy in particular, 500 clergy who did not address their letter to the Cardinal. Clearly, the English Hierarchy are feeling somewhat 'on edge'. I personally agree with Cardinal Burke that these incendiary ideas should never have been put up for debate in the first place because they so obviously sow confusion, give rise to the promotion of error, sow division and even rancour. It places the Church in a state of war. It makes very open the wound of disunity with the Church that has existed for a long time. Pope Francis's predecessor made it well known that he considered it wrong to confuse error and dissent from the Magisterium with contributions to a fruitful debate or 'dialogue'. That served to irritate liberals but maintained the Petrine ministry as the primary source of unity in the Church, grounded in the Magisterium, rather than make that same ministry a source of disunity reflecting human opinion based on a modern anthropological discourses that fail to take seriously the actual teachings of Jesus Christ and His Church. Here we are, however, in 2015, being coerced into that very debate which was settled by Our Lord, whose message of repentance for the forgiveness of sins has successfully - at times more successfully than at others - been transmitted by His Apostles to their Successors down the ages. The entire Gospel, whole and undiluted has been handed down faithfully, through thick and thin, weathering the storms even of the greatest crises in the Church's history. Is that time coming to an end? Faithful Catholics can never say it is. The truth, even if judged a lie, even if crucified, will rise again. Indeed, while the Synod comes closer into view, it is also a time when something else comes into view, something that serves to remind us of precisely what is at the root of the current grave crisis afflicting the Church. During Holy Week, we will remember vividly in the liturgy how Christ's enemies conspired to arrest Him, imprison Him, interrogate Him, place Him on trial, mock Him, scourge Him, crown Him with thorns and crucify Him. We will recall how a dishonest and violent man was preferred in the place of the Lord when a crowd were asked who Pilate should set free. We will see the glory of God, Christ crucified, the Saviour of the World, out of love, permitting all manner of evil to be perpetuated against Himself to gain for us our redemption. In all of this, we see the effect of our own sins and how our sins have caused Jesus so much pain and suffering, but, as well as this, we see what it means for Christians to bear witness to their Lord. Where the Head has gone, so the Body must follow. We see that the renunciation of self-interest and self-love is the guiding principle for the Christian who seeks to follow the Lord because we are commanded to love God with our whole heart and our neighbour as ourselves. The Christian is given a powerful insight into the very nature of God and the true nature of love - a love that is not self-seeking at all. Quite simply, there can be no Christianity, for the Christian, without a share in Christ's Cross, if we wish to enjoy the radiance of the Resurrection. We see how much Jesus suffered to establish the Church as His Bride, how much the Bridegroom has loved the Bride, that He should empty Himself even of His Precious Blood for Her. This is mercy and it is not a glib, easy, artificial mercy. It is hard, it is painful, it is, frankly, gruesome. It is blood, sweat, tears, courage, fortitude, prayer, agony even, yet a loving act that is freely undertaken by the Lord. Can we, as Christians, expect our lives, our temptations, our lifestyle choices, our daily choices, our very existence to be without those sorrows and tribulations and sufferings that our Divine redeemer accepted for love of us? The Synod's primary protagonists propose a new era of 'mercy' shown to those who from a rudimentary understanding of what the Eucharist is, should understand is no mercy at all. Mercy, compassion and love, in this framework set out by the Synod does not challenge us to do as Jesus not only taught us to do, but by His example, actually did do. "If anyone wishes to be a follower of mine, let him renounce himself, take up his cross daily, and follow me." This is the message that the Synod - if it wishes to be in continuity with the teachings of all Popes, Doctors of the Church, Saints and Church Fathers - as well as Jesus Himself - should propose again for the Church and the World. Are you a homosexual? 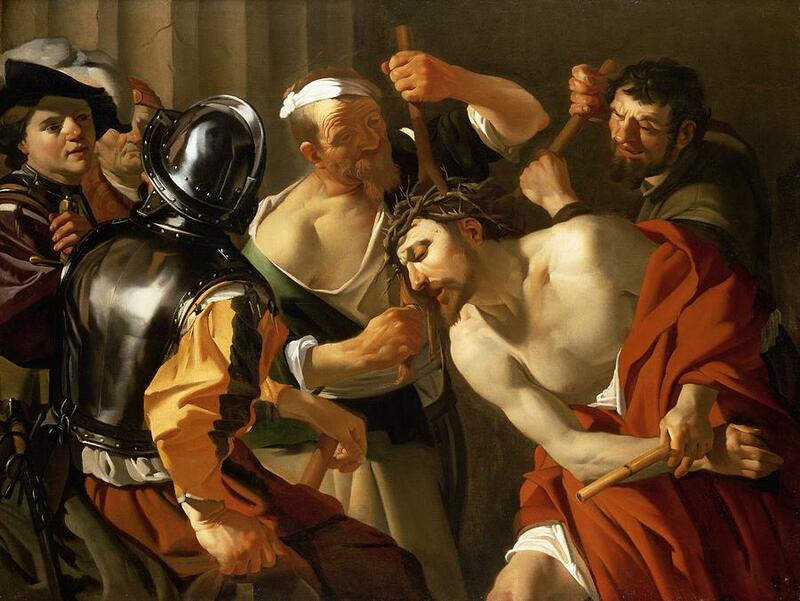 Deny yourself, renounce yourself and follow Jesus. Are you divorced and remarried? Renounce yourself, take up your cross daily and follow Jesus. Whoever you are, whatever your situation, the answer is Jesus Christ and His Cross. Whoever you are, do as Jesus has told you to do. Follow in His bloody footsteps. Follow Him, don't follow the crowd, the ways of the world that lead to perdition and unhappiness. Jesus offers us a new way of living that does not do away with pain and suffering but makes it bearable, because his burden is light and his yoke is sweet. He is your Saviour. He is my Saviour. The Church acts in His name and carries out His mission, not her own project, for She has no mission of her own, no novel niceties that can make the narrow way broad or the straight way crooked. Jesus makes the narrow way joyful, because we have been given the power to live as sons and daughters of God. He liberates us from sin, He does not liberate us from our own duty to refuse evil and choose good. We can choose truth, goodness and purity, a love that is disinterested even in our own interest if that conflicts with God's will and God's law. By ourselves we can do nothing, but with Jesus, we can do things we never thought possible. If the Synod wishes to propose to mankind once again the glorious truths of marriage and the family - something it is yet to even start to attempt to do, then put forward as examples those courageous men and courageous women throughout history who have sought Jesus and found Him, who have lived in mortal sin and escaped it, who have been in the snares of the Devil but triumphed over him, who by their lives made following Jesus Christ, carrying their own Cross, appear to be what it truly is, attractive and beautiful, inspiring and life-changing. There is no Christianity without the Cross. We cannot follow Jesus and remain at odds with His teaching. We have to make choices in our lives and there are choices that we make will take us towards God and choices that will lead us away from Him. The Church cannot propose another way than that offered by its Divine Spouse without deceiving its members or leading them into the abyss. Jesus Christ is the Way, the Truth and the Life. With Him, we can overcome every obstacle, we can leave a life of sin and self-love behind. We can be enabled to share in the life of the Trinity itself and love as God loves. It is not easy. It does require effort, prayer and fidelity to Christ. It does involve our will. A Church that offers a different kind of Salvation to that which is proposed by Jesus Christ will save and serve nobody. Having accepted a lie, it could even end up serving the father of lies, the Devil himself. We all want Easter, we all want the Resurrection, but as the Synod and so many in the Hierarchy make abundantly clear, the Cross is as unpopular as ever. There would have been no Resurrection without the Cross that came before it. May we all embrace it with gratitude that our loving Saviour has endured it for us and broken the power of sin and death for us. May the Church and its ministers always be faithful to Jesus Christ Crucified and in so doing, show us His great love, His great mercy and His ardent desire for our salvation. 500 priests have signed a letter and 400 laity have signed a petition stating their fidelity to Jesus Christ and His Teachings. In doing this, they have shown their love for Jesus and His Church and their acceptance of the Cross. It cost Jesus Christ so much - everything - to give us Himself, His Body and Blood, to make us members of His Church. What a terrible betrayal of Him it would be, if at the Synod, He were to be rejected by His own people once again and those in official authority over the people of God, once more, make Jesus Christ an object of scorn, spit and derision and make Jesus Christ, once more, appear loathsome in the sight of men. Far from achieving the permanent exclusion of this 'troublesome preacher' from the Temple of God, they would only show once more that what looks like certain defeat, a curse, is the sign of Christian Victory. When Benedict XVI lamented a dictatorship of relativism, few of us thought he was talking about the Church. Those who came in his wake can crucify the Truth again if they like, but they shouldn't be too surprised when it rises again. "500 priests have signed a letter and 400 laity have signed a petition stating their fidelity to Jesus Christ and His Teachings...A Church that offers a different kind of Salvation to that which is proposed by Jesus Christ will save and serve nobody. Having accepted a lie, it could even end up serving the father of lies, the Devil himself." PS. Beautiful icon. 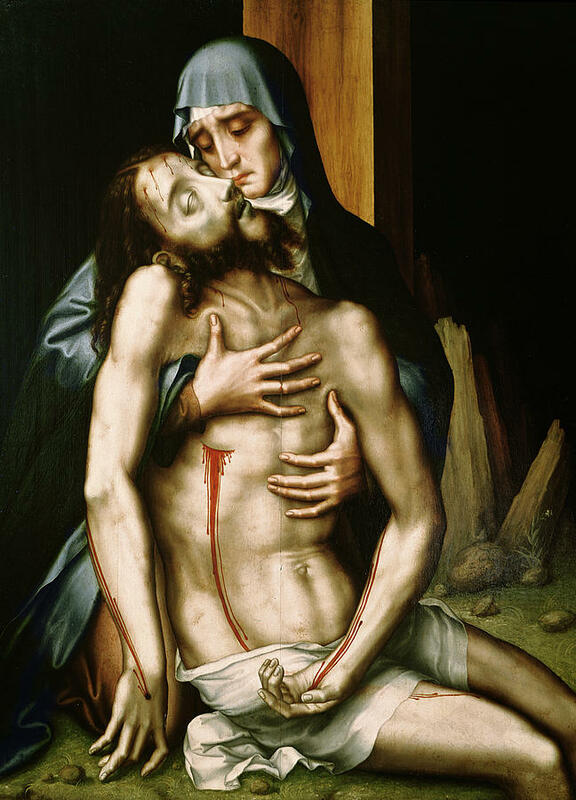 I have often seen in the Pieta the image of Christ in Blood and Flesh offered up to the Faithful. Thank you for this powerful and beautiful post. Through this crucifixion of His Church God is sifting each heart. He wants to know who puts Him first and who does not. Each of us will be called to make that choice and the time when water can be carried on both shoulders is long gone. I LOVE when you said that those who crucify the Church should not be surprised when it rises again. Just beautiful. Keep these articles coming, Lawrence. One of the most masterful posts you have ever written. I thank God that He made you, Bones!! As the Friday sun dims. Ripped flesh from your spine. Glad God made the Bonester too. And enjoy your poetry, Skirts. Some are saying that once priests are required to openly give Communion to folks in mortal sin, that this will be the manifestation of abomination of desolation prophesy fulfilled. I agree with Cardinal Burke; the synod should never have occurred in the first place. I suspect it was Satan's way of creating chaos and doubt within the Church. Divide and conquer. 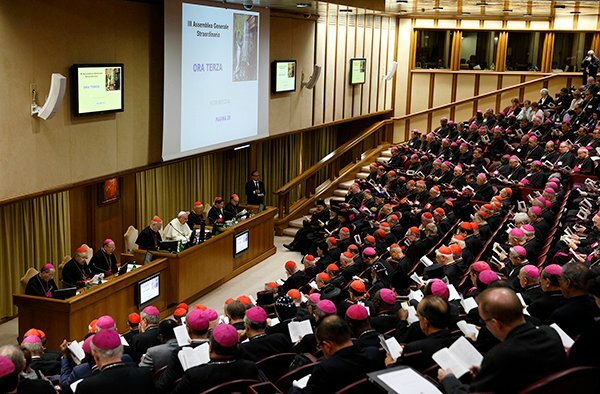 But what is most obvious to me is that the entire synod scenario appears to be an attempt to tempt us as Adam and Eve were tempted in the Garden of Eden. God told them they had free reign with the exception of the Tree of Good and Evil. He told them not to eat of it or they would die. No ambiguity. We all know the rest. Christ's Bride, the Catholic Church, is founded on His Truth and the Catholic faith is the embodiment of the total and complete deposit of the faith. Consequently to "dialogue" about truths which are part of His established Truth is classic serpent speak. Don't do it!!! Thank you for this splendid article Laurence. It will surely encourage many. We don't buy the 'Catholic' papers, but noticed a copy of the Universe in a church porch yesterday. The front page is running with the heading 'Cardinal in Mercy Plea as Priests' Reject Reform'. Everything becomes turned around. Diabolical disorientation. Countless souls in danger. Your article provides a timely antidote to the airbrushed version of mercy being presented to the masses. As the psychological warfare of false-mercy gains ground, it will be important for faithful Catholics to insist on the need for true Repentance, Confession, and Satisfaction. CCC 1450 - 1460 will be a helpful resource. May God bless you for all you are doing for the Truth. I wholeheartedly support the priests who signed the letter stating their fidelity to the teaching of the Church on marriage. I am truly confounded by Pope Francis's indulgence of Cardinals Kasper and Marx. What can he be thinking?! Yesterday at Staples, where I was shopping for computer supplies, I saw a shelf that had materials for things like "Make Your Own Will." There was one for "Do Your Own Divorce." It is that easy to promise lifetime fidelity and then to break the vow. What possibly would the Eucharist mean to people under these circumstances? We must stay the course. My husband and I have been married for 45 years, we raised our children to be Catholic, and they are raising our seven grandchildren in the Church. We do not want that Faith distorted or watered down. The same question which needs to be asked of the cardinal could be answered by one of the 500 priests. Since it is upon this doctrinal error (un known to Catholics) the Jesuits hand picked by the pope are to theologically support Cardinal Kaspar at the Synod. Since there is 'known salvation' outside the Church why cannot the Eucharist be given to the divorced and remarried will be their theology. If the dogma can be developed ( with this irrationality) wht cannot there be changes in other areas of the Catholic Church they will ask. bravo... such powerful, direct and truthful words ..!! yes a "terrible betrayal of Him(Jesus) it would be... rejected by His own people once again..."
But, we will see .."Those who came in his wake can crucify the Truth again if they like, but they shouldn't be too surprised when it rises again". Very encouraging, God bless you! Since the crux of the matter is whether to give Holy Communion to those not in a state of grace, I think that ship has sailed. Are non-Catholics, who do not have recourse to sacramental confession, likely to spend their entire adult lives without a single mortal sin? * paragraph 125 says do not try to proselytize when giving sacraments to non-Catholics! What Can the Laity Do to Support the Clergy? Who Goes Back is Wrong?